As the world celebrated the centenary observance marking the end of the first World War on November 11th, the traditional sounds of ‘Last Post’ and ‘Reveille’ rang out also in Bermuda, the notes commemorating the millions of people that perished during both WWI and WWII. The person tasked with the honour of playing the poignant musical tributes was born years after both World Wars ended, with 15-year-old Alexander Miller performing the noteworthy honour. 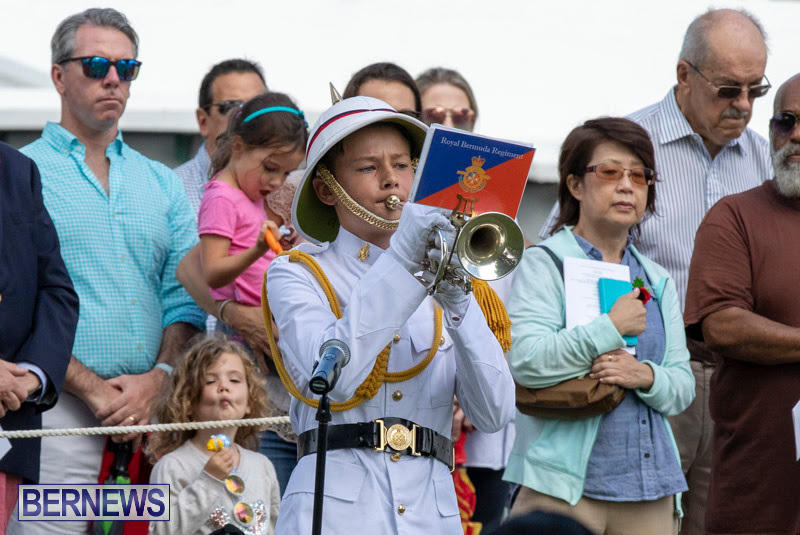 And while not the first parade the young musician had played in with the Bermuda Regiment Band, it was one of the most memorable as he blew forth the melodious tone. Miller started with the Regiment band in June of this year after being introduced to members following his participation at a Master-class featuring Matthew Ross on trumpet. Even with years so young Miller has much to his resume of retreats and ceremony. The teenager explained how he developed the bug for marching band performing after many trips as an even younger youngster to the many pomp and ceremonial displays. “My father would bring me to the parade when I was younger but this is the first time that I was a part of it,” he said. “Frankly, I was terrified to play in front of his Excellency the Governor, the Premier and all the other dignitaries, but at the same time, I was very excited. Away from blowing the horns Miller has a penchant for cycling in his spare time, a discipline with which he’s proven also to be adept. By musical march or by pedal, Miller stays harmoniously in step.